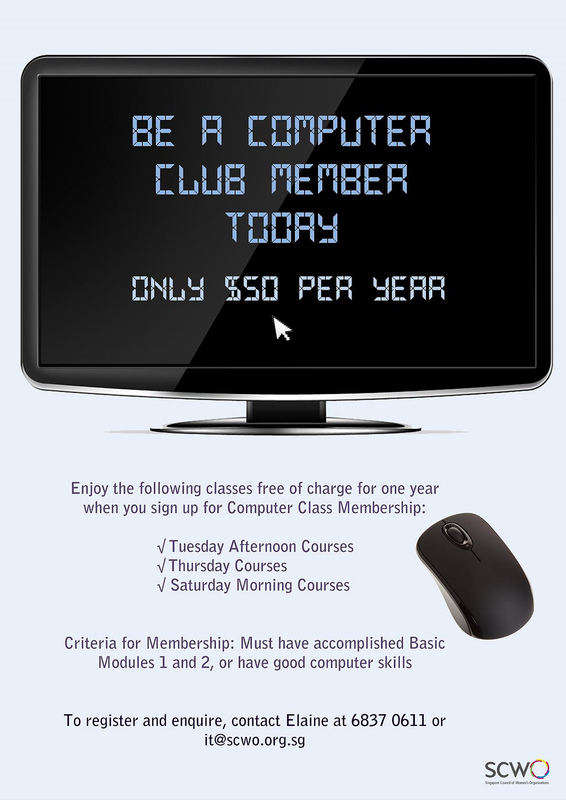 IT Hub offers classes of a relaxed and gentle-paced nature that teaches its students basic computer skills, like Microsoft Word basic concepts, simple image editing, putting together PowerPoint slides, composing and sending emails, and accessing the Internet. The instructors are made up of volunteers with a passion to encourage those who are hesitant but willing to give technology a go. Students come away with a sense of achievement and fresh vigor after embarking on their early journey with IT. In 2001, IDA (Infocom Development Authority of Singapore) approached SCWO to be one of its lead Agencies in the E-Ambassador program. This program was in line with the national goal of building an e-inclusive society. IDA assisted in the setting up of the IT Hub offering training in Information technology to women and their family members. SCWO has been recognised as a truly a lead agency with more than 30 E-Ambassadors (volunteers who committed themselves to IT training). The IT hub is equipped with the latest LAN System generously donated by Hellermann Tyton, a Network Cabling Solution company. 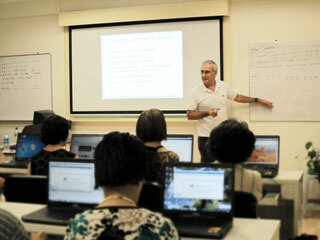 It is also equipped with 20 Laptops and the latest software. The volunteers have been conducting various courses since 2001, and have been awarded “Long Service Awards” by both SCWO and NCSS. They also regularly train more Tutors to continue their good work. 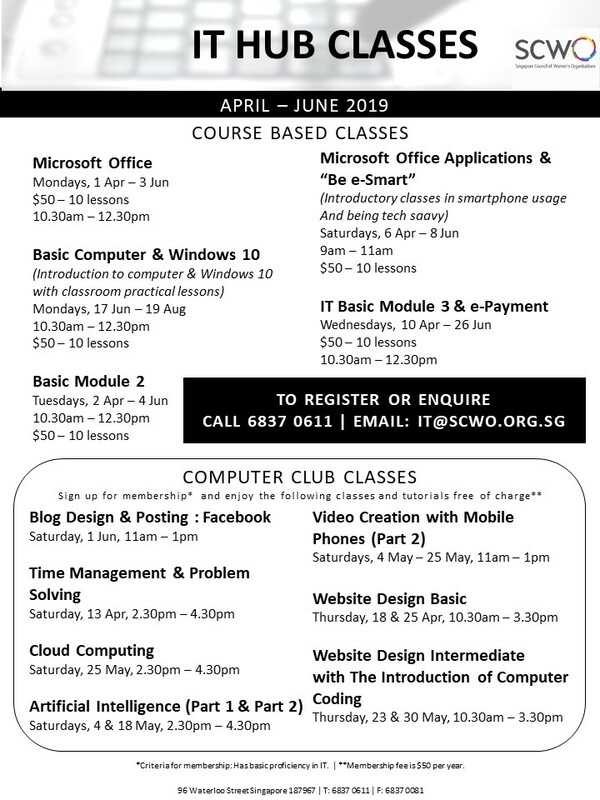 Call 6837 0611 (Caren) or email IT@scwo.org.sg for more information. Register at SCWO Centre, 96 Waterloo Street, between office hours (Mon to Fri, 9am to 6pm). The IT Hub Room, which is fully equipped with laptops with broadband connection, is available for booking for $280 per 4 hours. Please call 6837-0611 (Caren) OR complete the booking form and email it to it@scwo.org.sg. All bookings are in 4-hourly blocks. Payment to be made in full PRIOR to room usage. Strictly 1 free parking allotment per event. Vehicle number must be registered prior to event. Rental of LCD Projector is an additional of $80/ per usage. No installation of foreign software and freeware without prior permission from SCWO Secretariat. No downloading of controversial materials from internet onto the laptops. Saving of any files (by trainers or students) in duration of workshop can be done only on desktop, and trainer/organiser takes responsibility in deleting these materials from the desktop. Using of storage drives (thumb drive) is discouraged and at organiser’s discretion only. This is to protect our laptops from virus infected external drives.